2P START! Live! : Pathetic Proposal Edition | 2P START! In this episode, a quick one before the big 100, you’ll hear a wedding proposal Ray deems unworthy, what Tim uses as an antidote for his daughter’s tears, and futuristic in-game product placement gone wrong. Episode 99! I can’t wait for the 24 hour episode 100. I hope that’s the case, because these podcasts are getting progressively shorter. Actually, they’ve been all over the place recently. This week’s is short, but besides #97, everything since 88 has been over half an hour, with a couple being over 40 minutes. Somebody should make a graph, actually. You guys are really spoiling me. I get a fun fact and a reply from Ray. All I need is a Tim and I’ll be set for life. Got tnough time today, about to listen. Msical Misfit Suggestion: Arkanoid DS: Fairy Reflection. Tim, Lily is adorable! She is mesmerized by the Invincibility video! That’s funny. Imagine how much crying you guys could prevent if you had the Lace game finished! Time to give Doritos a call. What would I like to see in Podcast 100? A regular episode. It’s what I come here for, and while celebration is nice, I don’t want to get it in the way of the flow of the show I love. Good podcast, guys. 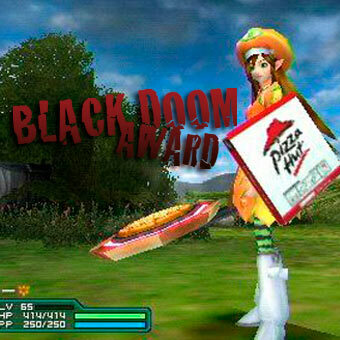 I always love the ones with more than 2 Black Doom Awards. Actually, you don’t really have to take a week off to prepare Ep100. The next week’s episode can be Ep101, then when you’re ready, fill that gap. ,,,Sounds a little ridiculous, huh? I remember seeing a news where a guy proposes using Brawl, A BIG SUCCESS. I wonder how much money Pizza Hut pay them to do this? Short podcast this week, but still pretty good! 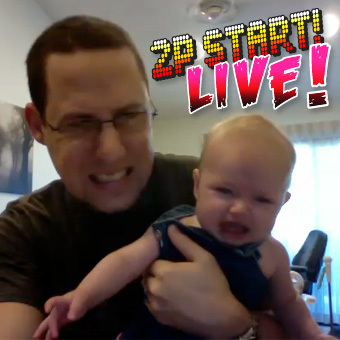 I really enjoyed Tim using Zip Chord to calm down Lily, and the BDAs were hilariously bad as usual. Definitely looking forward to Episode 100! For my Musical Misfit suggestion this week, I think I’ll go with Bungie Running Beeps 01 from Rez. I’m pretty surprised that I hadn’t thought about this game until now. Great podcast as usual. I’d like to hear a completely unedited podcast for the 100th episode. I kid I kid. Although I would really like to hear a return of catch the chickens, some trivia of some sort, and maybe something new. Also since you said you want new people to suggest musical misfits may I recommend The Legendary Hero from Wind Waker. Nice glasses, I need to add those in to my next comic. 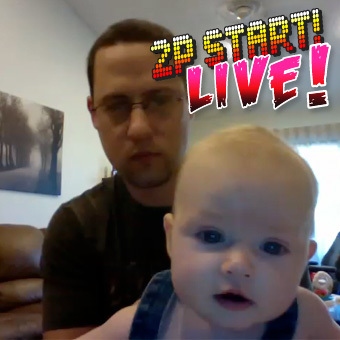 Lily looks cute, and it is nice to see that you are already getting her into the family business of 2P START! Maybe you can let her write a comic when she gets older. I know this is a horribly late comment to this podcast (just relistened due to listening to music collection on random), but CKcheeseboy’s comment was awesome and made me burst out laughing at work. Ray, maybe you should make a Lace plushie for Lily, that will probably keep her from crying ;D. As for the proposal, whenever someone proposes with a video game, IF for some reason said person wanted to, then he should have some sort of safety net, but even then its a bad idea. 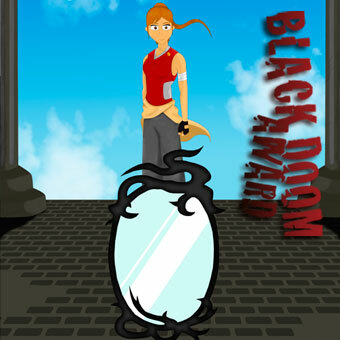 And honestly, that Reflection game art seems like something from Deviant Art. Short but sweet! Nice remix selection. Also, I think this was the first time I’ve seen Tim in a video (aside from that cameo you guys had in the background of that one game conference report, but that doesn’t really count). And Lily’s adorable! Regarding #100, I have to agree to some extent with Kvb, that an overall “normal” Podcast would be nice, though I’d suggest also throwing in some special segments, like maybe another Knubby Awards, or even bring back some old segments like Trivia for Two, Internet Loot, and Chicken Grab. Something special to celebrate, yet not interrupting the flow. Oh, actually, you know what I’d especially love to hear on Podcast 100? I’d like to finally know what the 2P START! intro/outro theme is called and where it was originally from (since if I recall correctly, Ray mentioned at some point that the song was actually taken from a video-game). I’ve been wanting to hear the full song of that for the longest time. Interesting podcast this week, but I was looking forward to episode 100 next week. The idea to have many callers at once could be a good idea though, but it would be a biznatch to edit. I wondered if anyone else would get that. Speakin of musical misfits, i think you made a good choice This week Ray. I remember playing the demo and thinking that that was a cool song. NPG, although maybe a bit too short. Sounds like Ray edited Tim’s third BDA into the outro, but we lost some of the context of what you guys were talking about. Was it a pack of accessories for the Wii? Or something else? For episode #100, I second the request for another Knubby Awards! What else…? Maybe the announcement of some new t-shirts? 😉 I guess I don’t have any groundbreaking ideas, but I wouldn’t mind taking a week off if you guys think you can come up with something super-special-awesome. Is people rising from their graves a spectator sport to you guys? You like to watch them rise… Never heard of that activity. 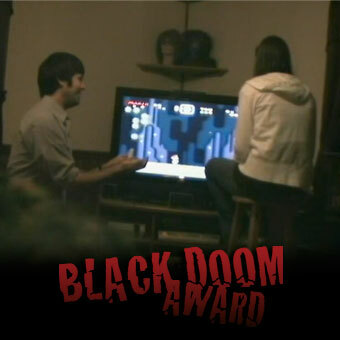 First black doom award goes to Tim’s lack in ability to raise a brow and feign an expression. Is this Reflection game left over from the early 90’s? That logo is SO old-fail. Not Old-School, Old-Fail. Ray, listen… you’re right that it’s not what men do to propose, but it’s what nerds do to propose. They do nerdy things. Like getting nerdy tattoos, and nerdy cardboard promotional displays for a nerdy movie or a video game. Or pre-ordering an operating system for their computer. It’s just how the culture is. Someday, you’ll be a nerdy grown-up man, and understand too. Well, great episode! Have a nice week! When I saw the article about breaking the TV with the tennis attachment on Kotaku, I thought that it was really weird how nobody else commented on the price. I am never trusting infomercials again. That Snuggy is NOT a $300 value! Good podcast guys. I actually kind of like it when they’re a little shorter. It makes it easier to download on my crappy internet connection. I am curious what Tim’s third BDA was. I actually don’t have anything to say really. BDA’s were pretty good and I almost suggested the first Built to Scale song myself a while ago. XD So needless to say, I liked the Musical Misfit. More Knubby Awards would be cool for 100, but you should create some new categories. Ending bit was funny too. The title already says it all, really. It’s the Stage 1 music of Shock Troopers 2nd Squad, called World Wide Connection. 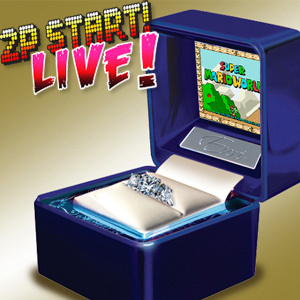 Okay, nice episode, but I gotta sound off about the guy who proposed with Super Mario World. The act of proposing marriage is one of those unpredictable situations that can only truly be commented on by those that have proposed themselves (whether successfully or not). Of course, I have no idea whether or not Ray has, but obviously Tim has. And Tim was obviously cautious in his jabbing of this poor guy. Myself, I have proposed twice. Two different women, but similar approaches. Turns out, the key thing to proposing, is knowing your target audience, aka “the girl”. Which brings me to my final point: We don’t know this girl, or the guy. For all we know she’s as emotional as Tim on a regular basis. In which case her response to the proposal was akin to an average person winning the lottery. So let’s give the guy the benefit of the doubt, cut him slack, congratulate him, and them wish good luck. Nice thoughts, FIreSpark. I appreciate your view of it. For the lame videogame related proposals, I have heard of one were someone made a Tony Hawk 2 level that gave you a gap that said “will you marry me” if you did a grind over the entire level. Besides, I watched the Super Mario video and the discription did say that she reacted more after the filming was over, I guess it took some time to soak in. Oh yeah, and Musical Misfit suggestion: I’m sticking to one of the songs I’d mentioned before, “Septette for the Dead Princess” (Remilia Scarlet’s theme), but this time as a remix of the original song, which appears in Touhou 10.5: Scarlet Weather Rhapsody. Lily should be Lace for Halloween. 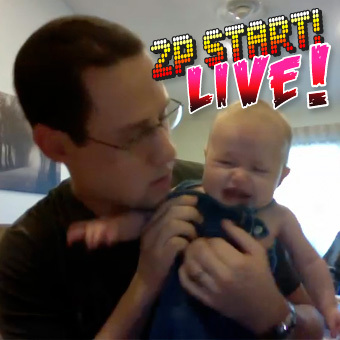 Nice parenting Tim. I have to wonder what continued exposure to Zip Chord (and a lack of tweens) will do for Lilly’s attention span. That said, I say continue…the cute factor is to great to ignore. What do you think…too many? Got to agree, Lily sure is adorable! I guess taking a week’s break to make Episode #100 is a good idea. If you guys wanted to play a joke on us, you could record 5 minutes of the same conversation at loop it for several hours and divide it into a bunch of smaller sections. Ray: What do you want to talk about today Tim? Tim: I don’t know. What do you want to talk about Ray? Ray: I don’t know. What do you want to talk about? Tim: I don’t know. What do you want to talk about? I’d probably end up listening to the whole thing thinking it would go somewhere. From Dark Cloud 2, great game, rather underrated. nice podcast guys but are you serious that we have to wait a few weeks for number 100! NPG but you scared me when i saw the title and the picture, i thought ray had proposed to someone, also does this mean i didnt get the job to replace tim? Yeah! 3 awesome Musical Misfit Suggestions! (is that allowed though?) One of them is bound to win! pardon me if im wrong, but i believe music musfit is for music from games that have been forgotten, and KH2 has not been forgotten yet! Think I have an idea for your 100th podcast, and depending on how it’s implemented it can still fit the bill of a “normal” podcast that all the fans above seem to be asking for. Lace being faceless makes the idea of a voice weird. Nice (but short) podcast. The part with Lily was absolutely adorable! Eh, guess I’ll throw caution to the wind and make a Musical Misfit suggestion also. I choose you! Dragon Quest 5– Toward the Horizon! http://www.youtube.com/watch?v=jym17LTegOw. If what I’ve heard is correct, Gamestop no longer carries new copies of this game, and it seems to have generally been discontinued across most major retail outlets (as of this writing, no copies are on sale at Amazon.com through their warehouse). If true, it’s a shame. It’s a good game,* and deserves to be played by more than just the die-hards that know where to find it. *(Oddly enough, haven’t finished it yet. In the final dungeon, though). Would you like a podcast in which people talk about how great everything is? Negative feelings inspire conflict and the only things that are interesting in life include conflict. Just got the Rhythm Tengoku Gold OST and apparently that song isn’t called Built to Scale 2, but Yellow Construction. Jesus, I’m commenting a lot. That’s probably just the Japanese name. For example, Phendrana Drifts is Ice Valley in Japan. Lily is the cutest thing. I JUST WANNA DIP HER IN MA COFFEE! Now it’s time for a section we like to call…creepy comments. I think you meant “sweetest”. It makes slightly more sense with that terminology. Otherwise, yes, I think it’s time for creepy comments. 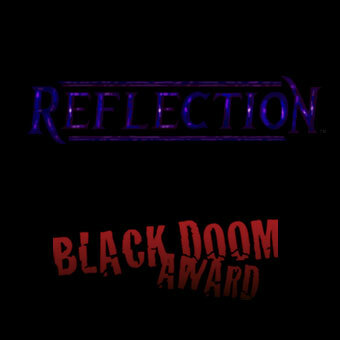 Prediction: The recently announced DSi LL will be one of the Black Doom awards for the next podcast. Also, I’m posting here because I’m just going through your guys’ archive, considering I found out about you guys a little late haha.